You can elect to modify the power supply included in this kit. Select one of the options below if you wish to modify, otherwise, the standard power supply will be included. The options include changing, upgrading and or deleting. The amount of current (amps) required for electroplating is determined by the total amount of surface area that is in the plating bath. Larger Kit sizes (eg. 20 litres and above) allow more surface area to be plated at one time and therefore more current (amps) are required. This high powered dual controlled switchmode power supply will deliver up to 40 amps which is ideal for our larger Kits. This unit is able to provide a constant Volts or constant Current (amps) which allows total control of critical ampere delivery which is a must for electroplating. It has a variable output voltage from 1 to 15VDC and variable current from 0 to 40A. It features overload, short circuit, over temperature and tracking over voltage protected. Output voltage and current are displayed on large, easily read seven segment LED displays and incorporates an intelligent fan control program that checks the fan at power on and adapts the right speed to ensure a quiet and efficient operation. The maximum current output is 40 amperes continuous. Incredibly light, weighing only 2.9Kgs. Includes mains power cable and positive and negative power cables. This slimline 5 Amp power supply provides up to 80W of power, still plenty of grunt for many smaller Electroplating Kits. 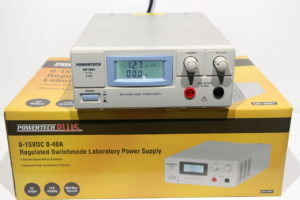 It is an ideal power supply for our 4 or 10 Litre size Electroplating and Electroforming Kits. It is also an ideal alternative for our Gold Plating Kits. (NOTE; If you are purchasing a 20 Litre Kit or larger, please consider the upgraded 40 Amp Power Supply. This will ensure you have enough current (amps) available). This unit is able to provide a constant Volts or constant Current (amps) which allows total control of critical ampere delivery which is a must for electroplating. This allows total control of critical ampere delivery which is not a feature of our 15 Amp power supply. Simply select your power range, then adjust the controls to obtain your desired outputs. It has a variable output and current from 0 to 5A. Available are 0-16V @ 0-5A, 0-27VDC @ 0-3A, and 0-36V @ 0-2.2A. Output voltage and current are displayed on large, easily read seven segment LED displays. Output is provided via banana sockets which will accept insulated banana plugs. Includes banana to alligator clamp leads. Incredibly compact in size and light, weighing only 1 kg. This compact adjustable power supply is designed for smaller Kits and is ideally suited to our Gold Plating Kits. The compact power supply is ideally suited for its quality, accuracy, controllability and size. Gold Plating requires a power supply with the ability to be able to accurately adjust the amps or current to suit the amount of output required for the surface area of the object/s in the plating bath at the time of plating. 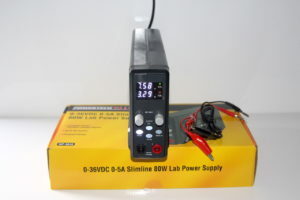 This is the ultimate power source for technicians and hobbyists without much space on their workbench. It has all the features of an exceptionally accurate power source, in a lightweight case barely as big as a multimeter weighing only 400 gms. Digital controls and a large LCD display provide accurate control. The supply can be operated in constant current or constant voltage modes, up to a maximum of 50W. It’s short circuit protected with banana plug sockets for power output, and it conveniently provides two 2A USB charging outlets too. The maximum current output is 3.75 ampere continuous. Complete 1 Litre Jane Gold-18 Kit. 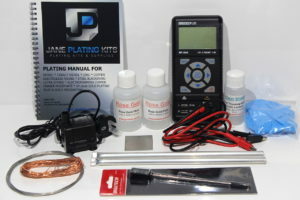 18 Carat Gold Plating Kit which includes all items necessary to successfully conduct your own gold electroplating. This kit contains plating chemicals which are mixed with water to create a 1 litre plating bath. It also includes a compact adjustable power supply that is ideally designed for our Gold Plating Kits. This is the ultimate power source for technicians and hobbyists without much space on their workbench. 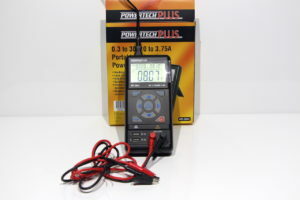 It has all the features of an exceptionally accurate power source, in a lightweight case barely as big as a multimeter. Digital controls and a large LCD display provide accurate control. The supply can be operated in constant current or constant voltage modes, up to a maximum of 50W. It’s short circuit protected with banana plug sockets for power output, and it conveniently provides two 2A USB charging outlets too. See the full list of Kit contents and Gold Plating information in the “ELECTROPLATING KITS” category on the home page. NOTE: The only items you need to supply are a suitable plating container and water to mix your plating chemicals with. Use only deionised, demineralised, distilled or rainwater for mixing with plating chemicals. Do not use tap water!